It is not feeling much like Halloween here in western Pennsylvania. On Monday, in anticipation of Hurricane Sandy, school was cancelled (Tue) and delayed (Wed), trick-or-treating was moved to Saturday, and school Halloween parties and parades moved to Friday. Gratefully, we had much less of an impact from the storm than was predicted, so kids are back at school today (on time!). But with all of the Halloween activities for today postponed, it feels like just another wet, slushy Wednesday. We were all prepared to wake up on Tuesday without power, but instead we had a great day at home together with nothing on the schedule! I love days like that. Days that can start with a great breakfast full of healthy things like pumpkin and oats and topped with unhealthy things like a thick homemade cinnamon syrup. New at waffle making? 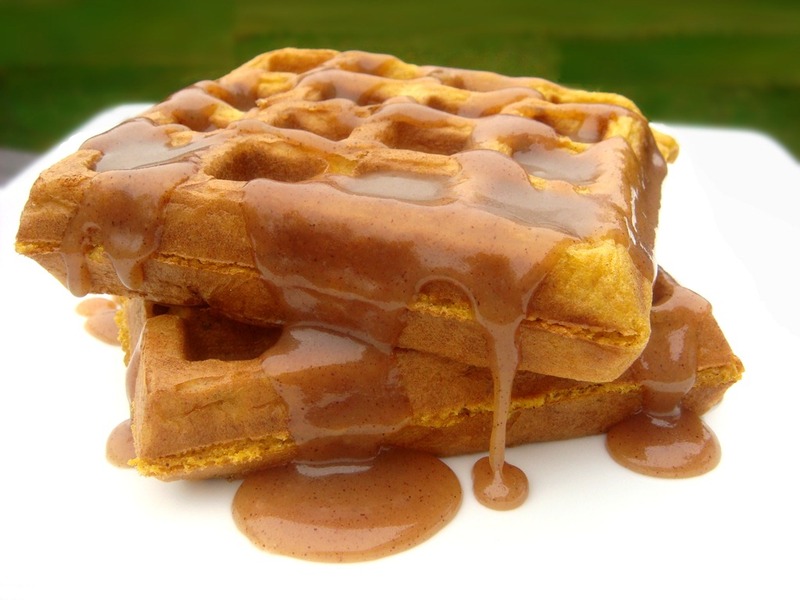 Try these Tips for Making Great Waffles. Combine dry ingredients in a mixing bowl. Use a whisk to mix. Combine wet ingredients in a separate mixing bowl. Use a mixer to beat thoroughly. Beat in dry ingredients until just mixed. Do not stir batter after mixing. Use a ladle or measuring cup to pour batter evenly into hot waffle maker (about 2 cups for the 4 small Belgian waffles in my waffle maker). Cook for about 3-5 minutes, or according to directions on your waffle maker. Remove waffles from waffle maker and place on a wire rack (not a plate). Serve immediately or keep warm in a warm oven (very low heat). Combine all ingredients in a small saucepan. Bring to a boil. Reduce heat; simmer for 5 minutes. Serve warm. Indian Samosa are delicious, but I find the homemade dough a little bit difficult to work with. So these are “Cheater Samosa” made with wonton wrappers. Be sure to use the small sized wrappers, about 4” squares. Samosa are a fried Indian pastry, filled with everything from minced chicken or lamb, lentils, vegetables, or potatoes. The most common ones in the United States are Aloo Samosa, stuffed with a spiced potato and green pea filling. 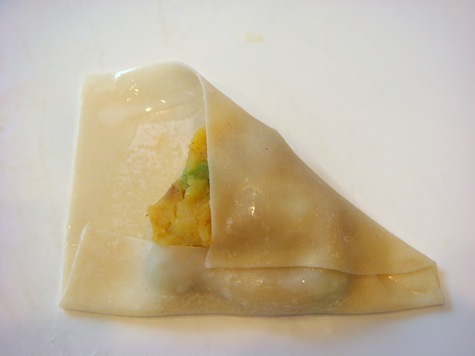 Working with one wonton wrapper at a time (keep remaining wrappers covered or they will dry out and become brittle), place about 1 Tbs of potato filling in the center of the dough. Use your fingers to shape filling into a triangle shape. 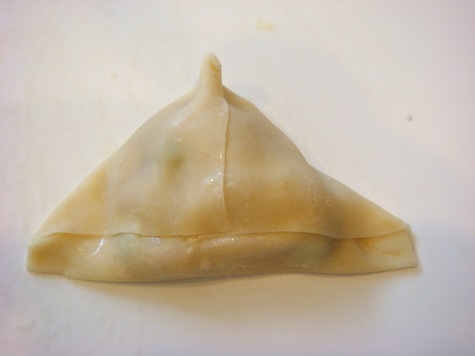 Use your finger to slightly dampen all of the edges of the wonton wrapper with water. Fold the bottom edge of the dough up over the filling (it should overlap the filling by about 1 cm). Fold the two sides of the dough down over the filling, creating a triangle (the top corners should meet, slightly overlapping, in the center of the bottom folded edge). 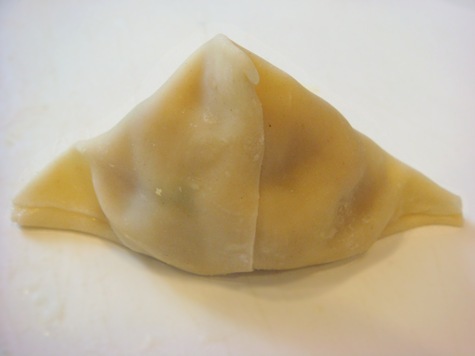 The two sides should overlap about 2 mm in the center of the samosa and where they meet the bottom edge of the dough. Pinch corners to keep filling from leaking during cooking. Repeat with remaining wonton wrappers. 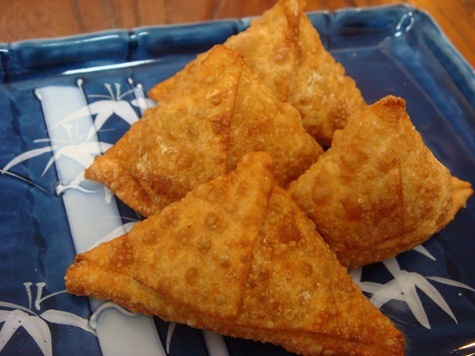 Stand each samosa triangle up on their bottom edge and press down slightly so that the samosa are self-standing. To keep the samosa from sputtering while cooking and to help keep the edges sealed, let the water on the edges of the dough dry before cooking. This should only take 2-3 minutes. If you fry them in the order that you made them, the first samosa should be ready to cook by the time you have finished making the rest of the batch of samosa. To cook, heat 1-2 inches of cooking oil in a skillet until hot. Reduce heat to medium and carefully place several samosa in the hot oil. Cook for about 5 minutes, or until golden brown, turning once. Use tongs to remove cooked samosa from oil. To keep samosa from getting soggy while draining excess oil, place a wire baking rack (like you use to cool cookies) over a double layer of paper towels. Place samosa on the baking rack while cooking remaining samosa. Serve hot with mint or other flavored chutney. Unfortunately, I did not get a picture of the samosa with the mint cilantro chutney, but you can see it HERE served with grilled chicken. Samosa are best eaten just after cooking, but they can be prepared ahead and reheated just before serving. Cook diced potatoes in a small amount of salted water until cooked through. Drain. In a small skillet, heat oil until hot. Sauté onion until soft. Stir ginger, Ancho chili powder, coriander, garam masala, kasuri methi, salt, cumin, turmeric, and cayenne pepper into onions in the skillet. Cook for 1 minute. Add cooked potatoes to the skillet. Use the back of a wooden spoon or a potato masher to coarsely crush the potatoes. Mixture should be mashed enough to hold together, but not smooth. Stir in peas, lemon juice and cilantro. Remove pan from heat. If potato mixture is too dry to hold together, add about 1 Tbs of water and stir into the potatoes. 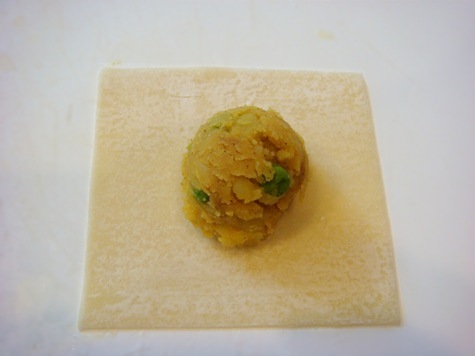 Working with one wonton wrapper at a time (keep remaining wrappers covered or they will dry out and become brittle), place about 1 Tbs of potato filling in the center of the dough. Use your fingers to shape filling into a triangle shape. Use your finger to slightly dampen all of the edges of the wonton wrapper with water. Fold the bottom edge of the dough up over the filling (it should overlap the filling by about 1 cm). Fold the two sides of the dough down over the filling, creating a triangle (the top corners should meet, slightly overlapping, in the center of the bottom folded edge). 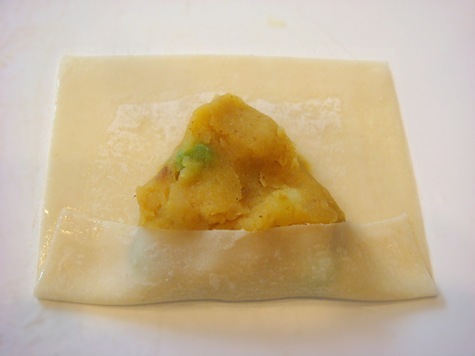 The two sides should overlap about 2 mm in the center of the samosa and where they meet the bottom edge of the dough. Pinch corners to keep filling from leaking during cooking. Repeat with remaining wonton wrappers. 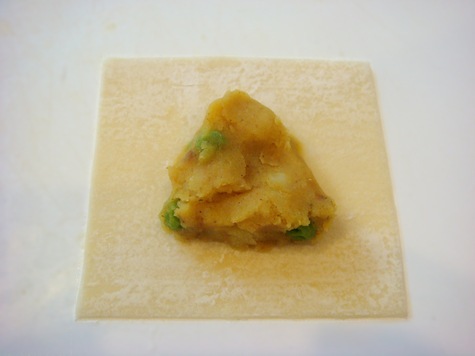 Stand each samosa triangle up on their bottom edge and press down slightly so that the samosa are self-standing. Let samosa sit for 2-3 minutes while heating cooking oil. This will allow the water to dry so that the samosa do not sputter when cooking. Heat 1-2 inches of cooking oil in a skillet until hot. Reduce heat to medium and carefully place several samosa in the hot oil. Cook for about 5 minutes, or until golden brown, turning once. Use tongs to remove samosa to a wire baking rack (placed over a layer of paper towels) after cooking. Serve hot with mint or other flavored chutney. 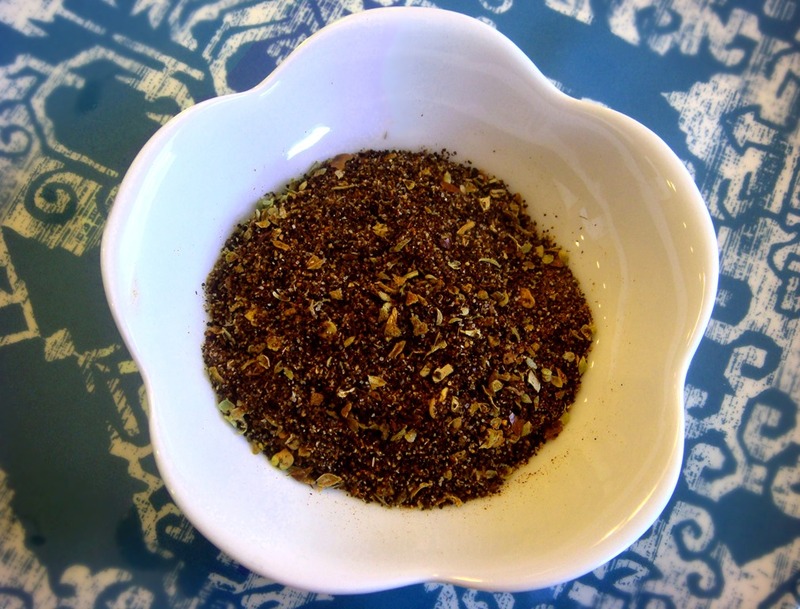 Using a blender, food processor, or mortar & pestle, blend all ingredients until finely chopped. Add water 1 Tbs at a time (usually about 2-3 Tbs total) until chutney is desired consistency. Most of my garden is finished now: just a few lingering tomatoes and herbs. And mint. Lots and lots of mint. Mint is an indestructible herb; plant it once, and it will be with you for life. Like it or not. Thanks to this mint chutney recipe, I really like the mint in my garden. There are actually both mint and cilantro in this chutney, but the mint is definitely the star player here. Chutneys are an Indian condiment that are usually a combination of both sweet and spicy elements, and often preserved with vinegar. 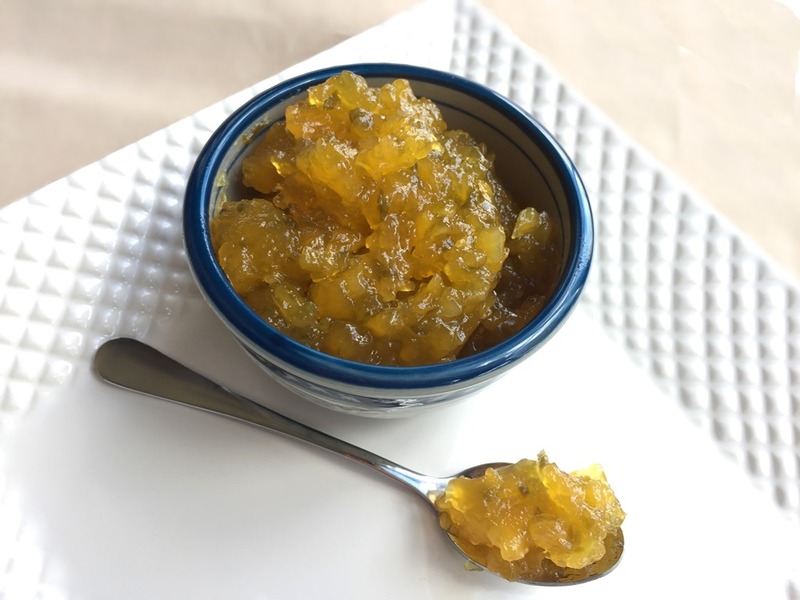 This chutney does not have a strong sweet component, as it uses mint and cilantro as the base instead of fruit, but it does have a slightly sour tang from lemon juice. The heat comes from onion and hot peppers. I make it pretty spicy, but you can tone it down by using less hot pepper. 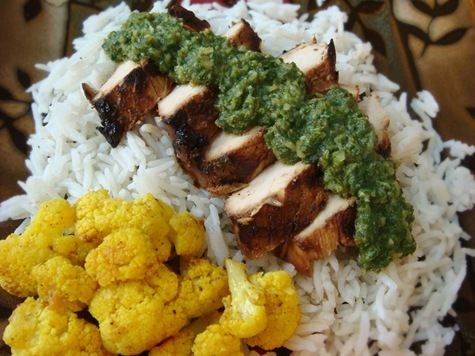 Mint chutney is a great accompaniment to grilled chicken, or more traditional Indian foods, like Samosa, tandoori chicken, or Naan. I used THIS RECIPE for the grilled chicken, which is called “Spicy Grilled Chicken”, but really isn’t all that spicy. 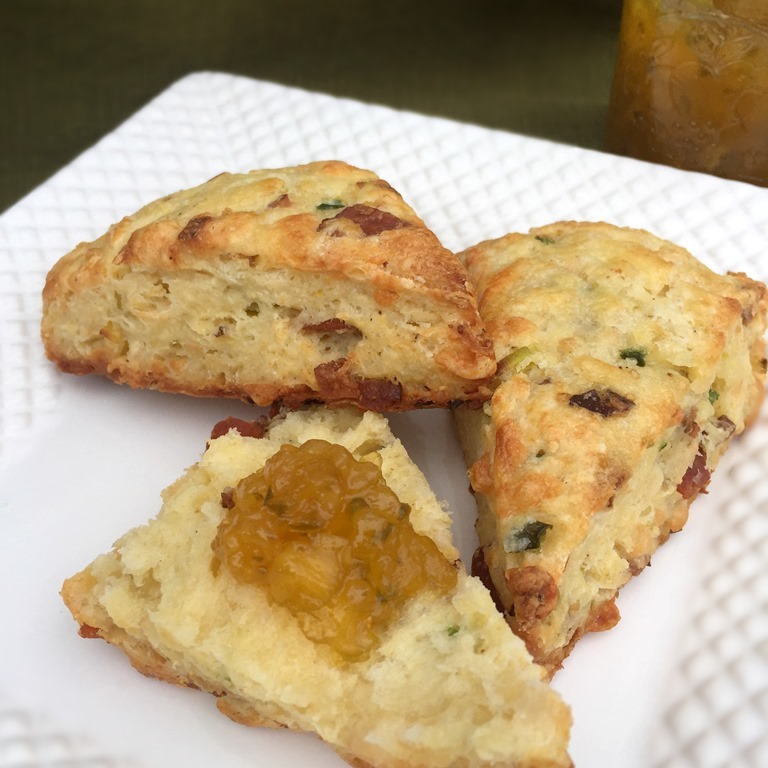 It has a little bit of mint in the marinade, so it pairs really well with the chutney. 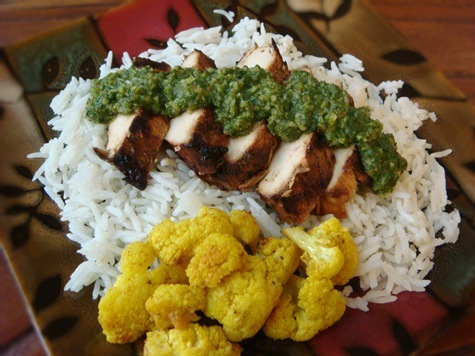 The Roasted Indian Spiced Cauliflower was also great eaten with the mint chutney. Serve with Grilled Chicken or roasted vegetables, or more traditional Indian foods, like Samosa, tandoori chicken, or Naan. In a Ziploc bag, mix spices with the olive oil and lemon juice. Add cauliflower to bag. Mix well and allow the dressing to coat cauliflower evenly. Spread the cauliflower in a roasting dish (line with foil for easy cleanup) and bake for 20-30 minutes. While cauliflower is cooking, prepare mint chutney or yogurt dip, and chill until serving time. When cauliflower is crisp-tender, remove it from the oven, and serve immediately with chutney or yogurt dip on the side. Combine all ingredients. Refrigerate until ready to serve. One of the treats that we made to go with our berry-picking haul was this raspberry topped cheesecake. 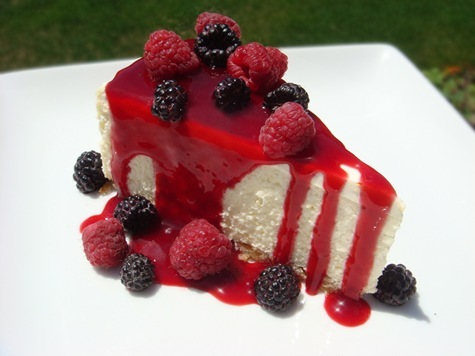 A simple creamy vanilla cheesecake topped with fresh raspberries and a raspberry sauce. For me, dessert doesn’t get much better than this. For a more in-depth look at cooking a cheesecake in a water bath, click HERE. 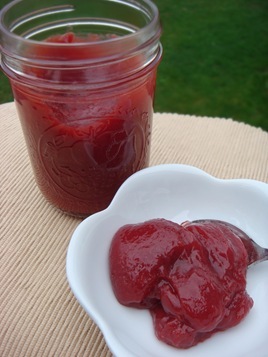 The leftover raspberry sauce (I made a double batch) has been great on ice cream and homemade waffles. Combine cookies and almonds in a food processor. Pulse until coarsely ground. Add melted butter and pulse just until mixed. Press onto the bottom of a 9″ springform pan. Bake at 350°F for 10 minutes. Cool. Wrap springform pan in a double layer of foil, or one layer of foil and then place in an oven bag (like the kind used for turkeys) or a crock-pot liner. Place springform pan in a larger roasting pan. In a large mixing bowl, combine all filling ingredients except the eggs; beat with a mixer until smooth. Add eggs and beat again, just until smooth (do not overbeat). Pour filling over crust. Fill roasting pan (not springform pan!) with very hot (almost boiling) water to about 2-inches deep. Bake cheesecake in the water bath for about 60 minutes at 350°F. The cheesecake will have puffed significantly, and the middle will still be slightly jiggly. Remove pan from water bath and run a sharp knife around the sides, but do not remove ring. 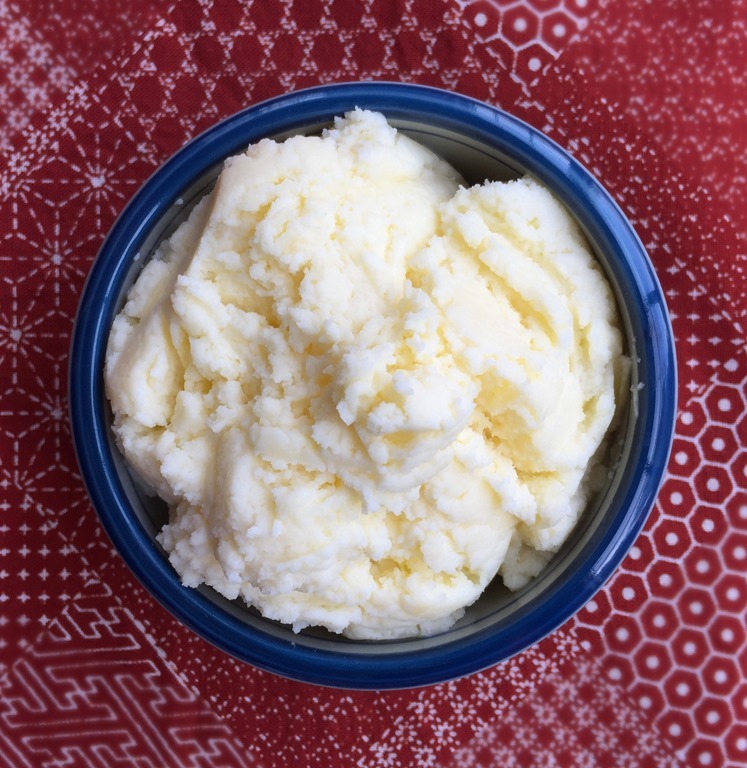 While cheesecake is baking, combine sour cream, sugar, lemon juice and vanilla in a small bowl. Pour over hot (cooked) cheesecake and let stand at room temperature for 45 minutes. Cover cheesecake pan (do not remove sides) with plastic wrap, taking care not to touch the surface of the cheesecake. Chill for at least four hours or overnight. Remove plastic wrap and remove the outer edge of the spring form pan. If desired, slide a sharp knife under the crust and slide the cheesecake off the spring form base and onto a cake stand or serving platter. 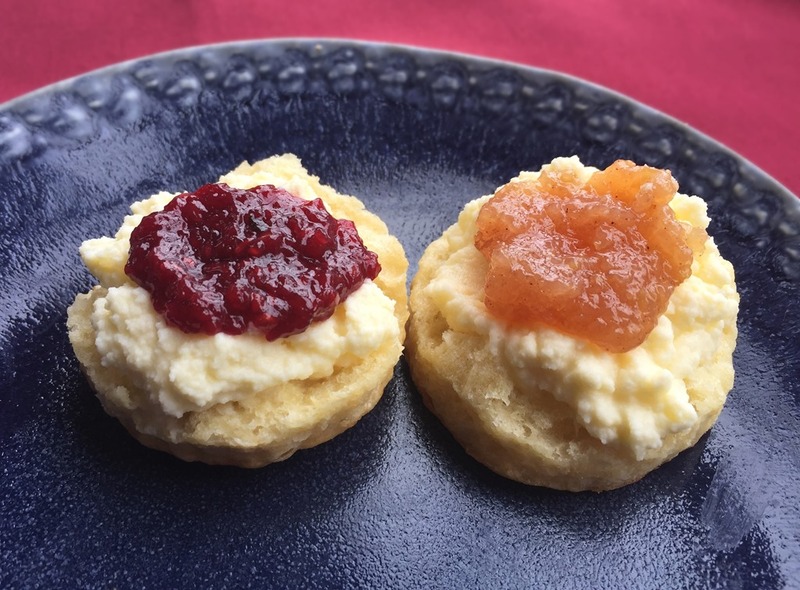 Serve cheesecake alone, or topped with fresh berries or Raspberry Sauce. 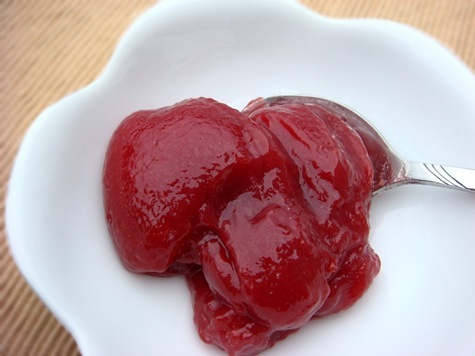 In a heavy saucepan, combine raspberries, 1/2 cup water, sugar and lemon juice. Bring to a boil. 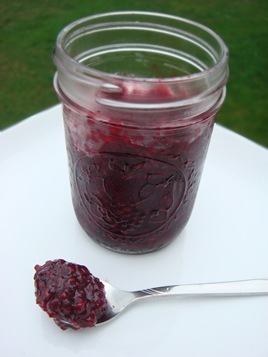 Reduce heat and simmer for 5 minutes, crushing berries slightly with the back of a spoon. 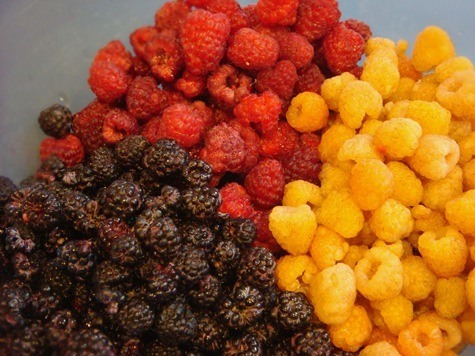 For a seedless sauce: strain the berries through a fine sieve, pushing the pulp through the sieve with the back of a spoon. Return seedless puree to the saucepan (rinse saucepan first if there are seeds clinging to the sides). Mix the cornstarch and water in a small bowl; stir into puree in the saucepan. Return mixture to a boil; lower heat and simmer for 1-2 minutes, or until slightly thickened and no longer cloudy. Serve warm or cold. The sauce will thicken more as it cools. 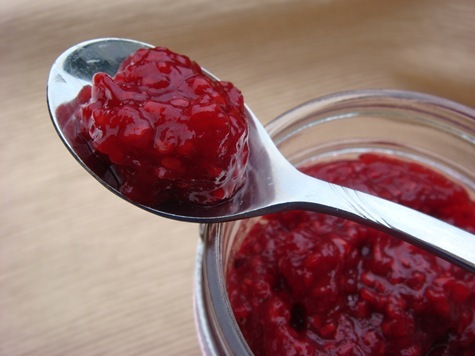 To make a Raspberry Filling (for filling cakes/cupcakes/pastries): use 2-3 Tbs cornstarch and 1/4 cup cold water to thicken puree. Chill filling until cold before using. Finger foods with dip are always popular around here. 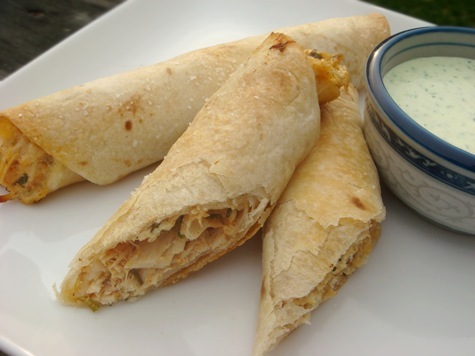 These chicken taquitos can be served with sour cream, salsa, guacamole, or our favorite is this creamy Cilantro Ranch Dressing. 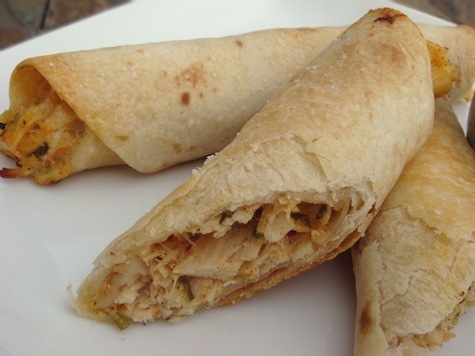 It is hard to say whether it is the chicken taquitos or the dip that is most popular. We use this dressing for all kinds of things: on taco salads or tostadas, for dipping quesadillas, as a regular salad dressing, over grilled chicken. Some little people around here have even been known to eat a vegetable or two if I serve this dip along side. It is also great as a dip for raw vegetables. The recipe below makes a dressing that is pourable, like a creamy salad dressing. If you want a thicker dip, substitute sour cream for half of the mayo, and use a little less buttermilk. I prefer to use flour tortillas for these, but you can also use corn tortillas. If you are using corn tortillas, place 2-3 tortillas between damp paper towels and microwave for 20-30 seconds to soften them before filling with chicken mixture. Corn tortillas tend to crack easily, so only work with a few at a time. Flour tortillas can be rolled easily at room temperature. Try to use the small fajita-sized tortillas; it is easier to get a tighter roll. Brush the filled and tightly rolled tortillas with a small amount of olive or vegetable oil and then sprinkle lightly with a coarse salt (like kosher salt). Bake for 15-20 minutes and serve with your favorite dip. These make a great main dish or appetizer. Cut in half on an angle for a nice appetizer-sized portion. Preheat oven to 425°F. Line a baking sheet with foil and lightly coat with cooking spray (or use non-stick foil). If you are using corn tortillas: Work with a few tortillas at a time and heat in the microwave between damp paper towels for about 20-30 seconds until they are soft enough to roll without cracking. Flour tortillas can be worked with at room temperature. Place about 3 Tbs of chicken mixture on the lower third of a tortilla, keeping it about 1/2 inch from the edges. Roll it up as tightly as you can. Place seam side down on the baking sheet. Lay all of the taquitos on the baking sheet and make sure they are not touching each other. Using a pastry brush, brush the tops of the uncooked taquitos lightly with oil. Sprinkle with kosher salt. Bake at 425°F for 15-20 minutes or until crisp and the ends just begin to brown. 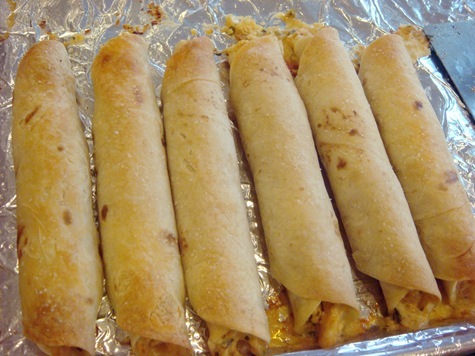 Serve whole, or cut taquitos in half on an angle (this is a nicer size for appetizers). Serve with sour cream, salsa, guacamole or Cilantro Ranch Dressing for dipping. Combine all of the ingredients in a blender or food processor. Blend until well mixed. Refrigerate for 1-2 hours before serving for optimal flavor. **Optional: Roast tomatillos for 20 mins at 400°F before adding them to the blender. If you are using a spicy green salsa instead of the tomatillos, go easy on the jalapenos. 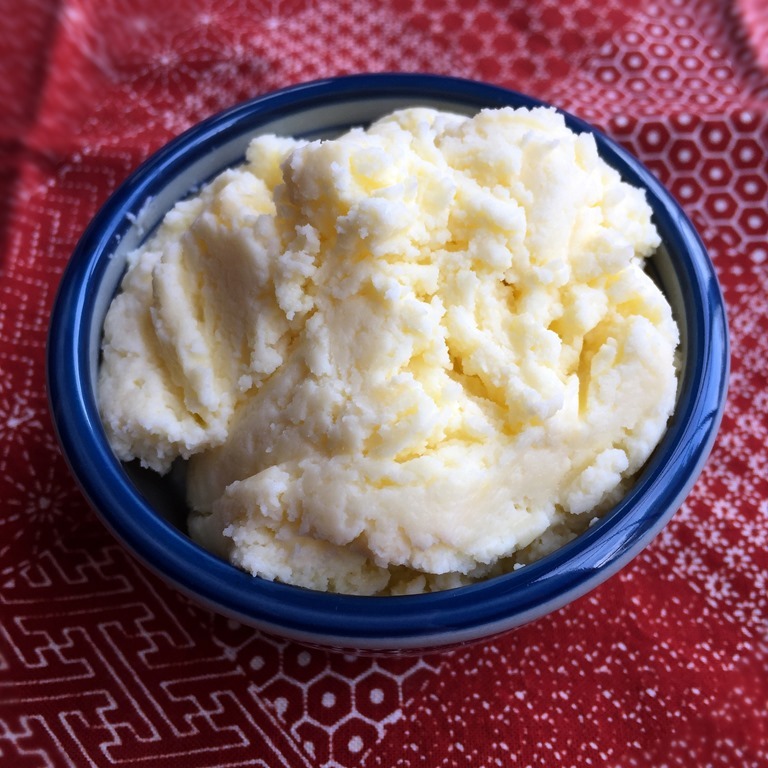 FOR A THICKER DIP: Use 1/2 cup mayo and 1/2 cup sour cream, and reduce the kefir/buttermilk to 1/4 cup.